When Esquire magazine planned an issue to salute the American jazz scene in 1958, graphic designer Art Kane pitched a crazy idea: how about gathering a group of beloved jazz musicians and photographing them? He didn’t own a good camera, didn’t know if any musicians would show up, and insisted on setting up the shoot in front of a Harlem brownstone. Could he pull it off? In a captivating collection of poems, Roxane Orgill steps into the frame of Harlem 1958, bringing to life the musicians’ mischief and quirks, their memorable style, and the vivacious atmosphere of a Harlem block full of kids on a hot summer’s day. Francis Vallejo’s vibrant, detailed, and wonderfully expressive paintings do loving justice to the larger-than-life quality of jazz musicians of the era. Includes bios of several of the fifty-seven musicians, an author’s note, sources, a bibliography, and a foldout of Art Kane’s famous photograph. What happens when you invite as many jazz musicians as you can to pose for a photo in 1950s Harlem? 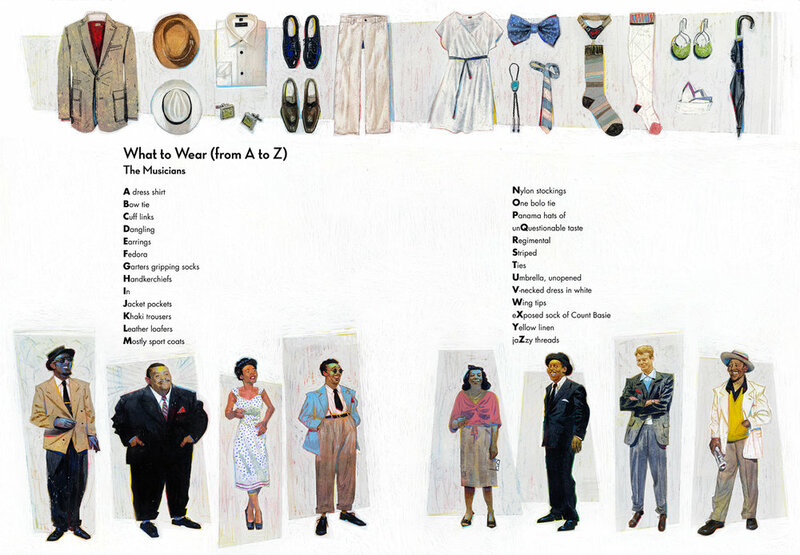 Playful verse and glorious artwork capture an iconic moment for American jazz. "When readers eventually open a foldout page to see the photograph, the moment is magic—alive with the presence and skill of the musicians, as well as the promise and potential of the children around them. 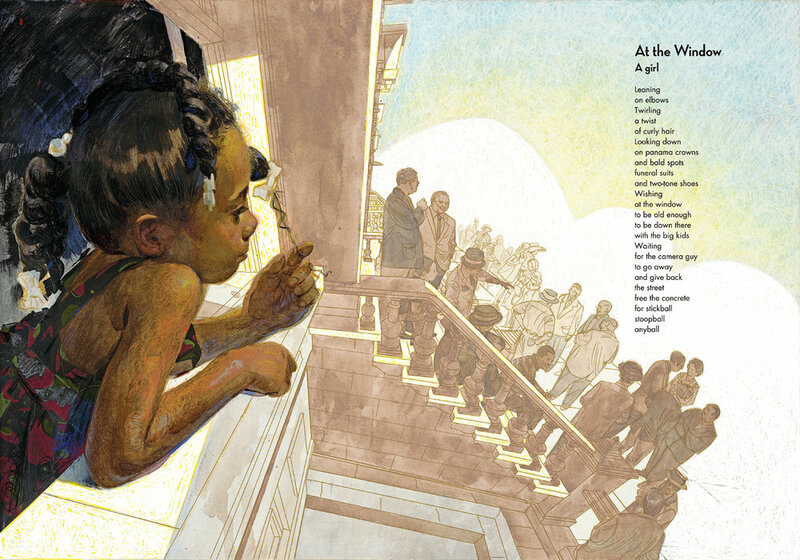 Beyond being a glorious tribute to these jazz greats, the book is also a phenomenal debut for Vallejo, whose dynamic acrylic and pastel images bring readers into the heart of the action of a day like no other." "Kids indifferent to jazz or photography will be swept up nonetheless in the novelty of the episode, the idiosyncrasies of the participants, and the shoulder-rubbing between the neighborhood kids and the adult celebs. Vallejo’s mixed-media illustrations are gems of freewheeling portraiture, drawing from the iconic photo itself and other film taken throughout the day. Orgill supplies biographical info on Art Kane and the musicians highlighted in her poems, and best of all, a double-page photo reproduction folds out at just the right moment from an asphalt black page with a single “‹ click.” Perfect." "Orgill, who has written about jazz for adults (and Ella Fitzgerald for children) is here paired with artist Vallejo, a welcome newcomer to the world of picture books, and they offer a memorable ode to a time and place, a celebration of music that was both hot and cool, and an endearing snapshot of the men and women who wrote, played, and sang jazz. Kane’s photograph, “Harlem, 1958,” is here immortalized in Orgill’s poetry, which swings and sways, and Vallejo’s vibrant artwork, which captures not just the players but the mood on 126th Street where the photo shoot took place." "A rich, unique, playful, and masterfully orchestrated work; Kane himself would undoubtedly be proud." "Vallejo's acrylic-and-pastel paintings vividly capture the shoot's vignettes and the skittish excitement of neighborhood kids. Pulling details from a 1995 documentary film and other resources, Orgill and Vallejo offer a dynamic, multifaceted work that deftly juxtaposes biography with praise poem, information with imagination. Teachers, librarians, jazz-loving families: take note." "Together Orgill and Vallejo have created a rich cultural history that while detailing the process of making the photograph — including the antics of those boys — honors the jazz artists who light up the image. The addition of musicians’ biographies, a valuable bibliography, and an elegant fold-out reproduction of the original photograph make “Jazz Day” both a celebration of an era and a valuable, vibrant resource, one that you should flip through with the volume turned up." "Little did they know that the photograph — featuring 57 musicians and a group of neighborhood kids — would become legendary. Roxane Orgill’s dazzling Jazz Day: The Making of a Famous Photograph (Candlewick, Ages 7 – 11) tells how this celebrated image came to be...Francis Vallejo’s striking acrylic-and-pastel illustrations offer similarly unexpected perspectives on streetscapes, nattily dressed musicians and interested onlookers." "The worthy winner of this year's Boston Globe-Horn Book Award for best picture book, Jazz Day is the behind the scenes tale of the legendary photograph, a process which apparently took as much talent, improvisation, and seredipity as an improvised Saturday night at Birdland. "The story of who came (and who didn't) is an unlikely subject for a children's picture book. All the more impressive, then, that this Boston Globe-Horn Book Award winner is as visually stunning and fantastically written as it is." 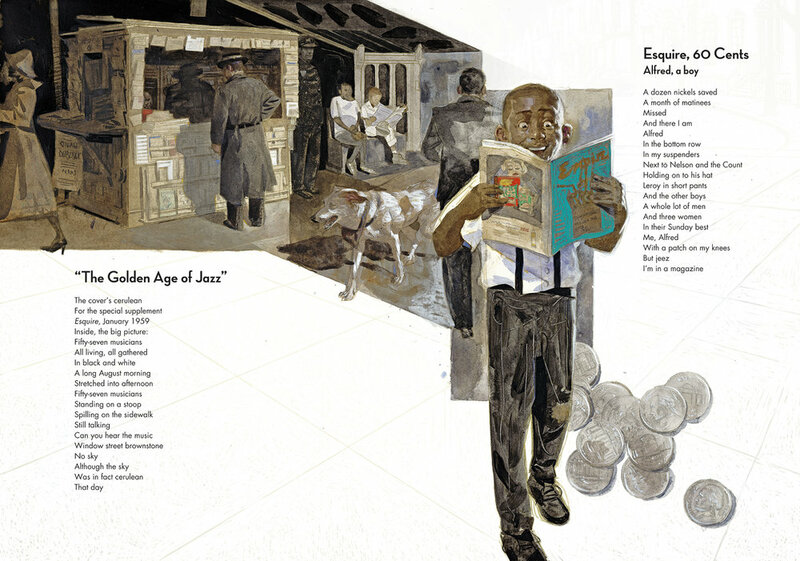 "The story of how the picture came together......is now retold with affection and grace in the new children's book Jazz Day: The Making of a Famous Photograph." "....Orgill recounts the history of jazz through a couple dozen poems - each accompanied by beautiful happy drawings by Detroit artist Francis Vallejo. Getting all of these stars together was not an easy task, but this book shows how much fun everyone had." "If you want a kid to get excited about music, this book is a terrific platform." "The gorgeous acrylic and pastel art illustrations perfectly capture the joyful chaos of the event." Francis Vallejo once tried to replace all S's in the dictionary with dollar signs. He is an artist. Blog, portfolio, and biography.